It’s pickle time! Pickling cucumbers, those knarly, hard little cucumbers that always seem dirtier than their large glossy cousins are in my local co-op and at the farmers markets, right next to the large stocks of flowering dill. I’m assembling the ingredients to do my own pickles and have the dill in a bucket by my front door, wafting its unmistakable aroma as I go in and out. My mouth waters just thinking about the kosher dill pickles my grandmother made. And the thought reminds me of my favorite pickle story. When I was in my late teens, I worked briefly as a cashier for a grocery store in Roslyn, Long Island, the New York suburb where I grew up. The pickling cucumbers and dill arrived at the store the same week my grandmother was paying us her bi-yearly visit from Ohio. Since my mother didn’t make pickles, preferring preserves, I decided that when my grandmother was with us, we would make pickles and I would learn from the master. I took it on as my project, getting the spices and kosher salt, the canning jars and ingredients, clearing space in the kitchen for the process to unfold. On the designated day, I came downstairs to see my grandmother bustling around the kitchen, asking my mother where various implements were. My mother was perched on a stool by the stove, answering the questions but not moving from her position. And before I could shut my dropped jaw, she turned to my mother: “Jean, you tell her. 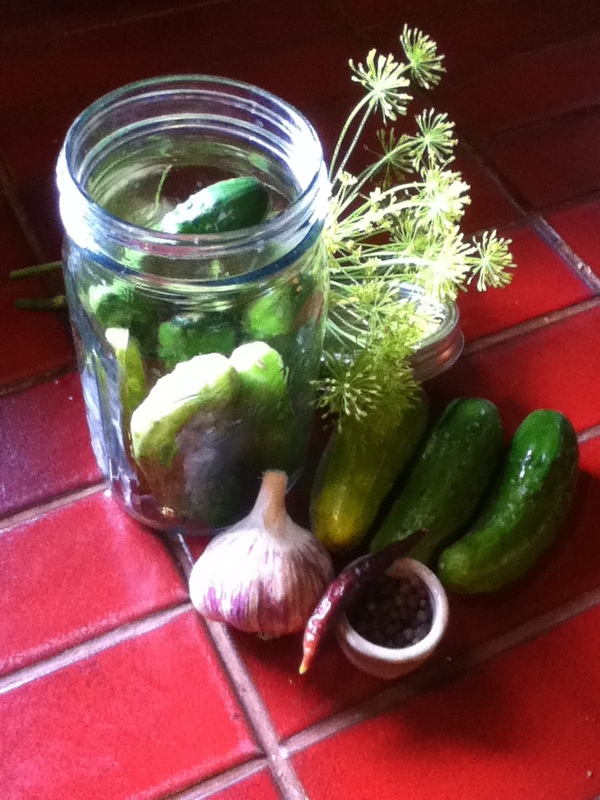 I never made pickles when I had my period.” My mother nodded sheepishly. My mother stayed out of the fray. I finally negotiated an agreement to let her pack one of the bottles herself, and I would mark the bottle and conduct a blind taste test when they were ready. My grandmother and I worked together efficiently and comfortably, packing a dozen jars with the ingredients that would result in the pickles I loved. My mother filled one, following the same process we had used, which I carefully labeled on completion. My grandmother had long since returned to Ohio when we conducted the Great Pickle Contest. All four of my family members agreed to participate. We took it seriously. I remember asking a friend to serve them, so none of us knew which was my mother’s. The results: my mother identified one jar’s pickles as softer than the other but nobody else mentioned a discernible difference. The pickle she said was soft was from her jar. But they were all equally wonderful and equally firm in my opinion. That’s my story and I’m sticking to it! Pickle making is more art than science. You have to decide how spicy, salty, garlicky and dilly you want your pickles to be. My grandmother’s pickles were brined, and never used vinegar. We didn’t open them until they were fully sour, not the half-sour some people prefer. You can eat them as new dills in 4-6 days, but the longer they sit, the more full flavored they become.